Live from the Samsung Galaxy S III launch in London | What Hi-Fi? First impressions of the new Galaxy SIII after a quick hands-on are that the Super AMOLED screen is seriously good. Oh, and we forgot to mention earlier on that the phone has Bluetooth 4.0 with aptX. We'lll bring you a full review as soon as we can, but we're signing off for now. A few details about pricing. The Carphone Warehouse has stated that the Samsung Galaxy S III will be available on Vodafone, Orange, O2, T-Mobile and Three and will be available for free on a selection of tariffs from £36 per month. If you're one of the first 1000 customers to pre-order the Samsung Galaxy S III, you'll also receive a free 10in Samsung Galaxy Tab, an InvisibleSHIELD screen protect and an in-car micro-USB charger. All other customers who pre-order will still nab a free 32GB micro SD card, a screen protector and the in-car micro-USB charger. Samsung will launch 'Scan and Match' service to work with its Music Hub (with 17 million songs available). Scans your music library and saves them to the cloud. Think iTunes Match. Samsung Galaxy S III release date is May 29 in Europe. It's the official smartphone of the London Olympics. One in the eye for Apple then. Suzi Perry of Gadget Show fame is bringing proceedings to a close. We'll be getting 'hands on' with the S III shortly. You can capture stills while taking 1080p video, as on the HTC One X and S. The 4.8in AMOLED screen is 22% larger than the Galaxy S II's, but the phone is 'not much larger'. Samsung promises 'wi-fi bonding' to double existing wi-fi speeds and in-call equalisation to improve call quality. Wireless charger, car dock, desktop docking station and flip cover are all optional. Sounds like Samsung has got most bases covered. Samsung has upgraded its Allshare DLNA streaming. Allshare Cast and Allshare Play allow instant sharing of content across devices. As we expected, it's available in 'marble wite' or pebble blue'. Apparently 'hyperglaze' makes the colours all shiny. Galaxy S III gets 'Pop-Up-Play' picture in picture allowing you to watch a video while you browse the web. Uber cool. Camera is said to have zero shutter lag in camera mode. 8MP camera is capable of 20-shot bursts. 'Smart stay' is the eye-tracking technology that keeps the screen on while you're looking at it. Spooky. S Voice can launch apps too. On to sharing. S Beam allows two Galaxy S IIIs to share content. NFC (near field communication) pairs them, wi-fi allows you to share content. We like. The Galaxy S III uses eye tracking to keep the screen on when you're looking at it. Clever. There's voice control too. The device is launching in 145 countries with 296 mobile operators. 3G version launches at the end of May in Europe. 4G is coming to US, Korea and Japan. Jean-Daniel Ayme hits the stage. "This is a phone that sees, that listens, that responds to our intentions." Phone has S Voice, Samsung's new voice control software. Similar to Apple's Siri. Telling it to wake up makes it wake up. Telling it to play music does so. Want to reply to a text with a call? Raise it to your face. Want to know what the weather's like? Just ask it. Looks a bit like the Galaxy Nexus in our view. As for the interface, it gets TouchWiz on top of Android 4.0 (Ice Cream Sandwich). New gesture functions are included too. That quad-core processor is combined with a new GPU that is claimed to be 65% faster than the Mali 400 graphics chip on the Galaxy S II. There's a removable 2100mAh battery, with a wireless charging option in development. You get micro-SIM and microSD slots, and there are 16, 32 and 64GB versions available. Other connection options include Bluetooth 4.0, WiFi Direct, DLNA, a micro-USB port and headphone socket. OK, it's official: the Samsung Galaxy S 3 has an HD 4.8in Super AMOLED screen, Samsung's new 1.4GHz Exynos 4 Quad processor, and 1280 x 720 resolution. There's an 8MP rear camera and 1.9MP version on the front. It's launching with HSPA+, but there's an LTE version coming later. At its thickest it's 8.6mm, weight is 133g. Right, we're in our seats and the hall is packed. Just a few minutes to go. Rumours say the Galaxy S III (or 3?) will come in blue or white. All the Samsung women here are dressed in white trousers and blue tops. Mmm, a clue perhaps? 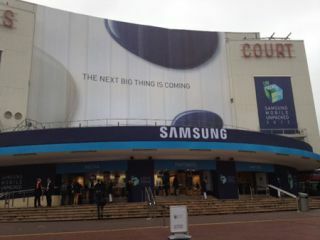 We're at Earl's Court in London eagerly awaiting the start of Samsung's Galaxy S III launch event. The front of the building is draped in a huge banner with the words "The Next Big Thing Is Coming", so Samsung is obviously following Apple's example and going for maximum impact with its latest smartphone. You can read what we know already (or think we do!) in our earlier news story. But we'll be bringing you the true facts and figures from 7pm tonight, so keep logged on to find out more.